Tomorrow is the anniversary of Daphne du Maurier's death. She was 81 when she died in 1989. By that time, she had written numerous novels, short stories and even some non-fiction. Her work had been adapted for film by such legends as Alfred Hitchcock: Rebecca and The Birds, and others. Although she wrote historical fiction, she is most well known for her macabre stories. She had a way of knowing what would touch a nerve in her readers. Some of her work could be categorized as horror, psychological thriller, apocalyptic, or suspense. I'm a huge fan of du Maurier. I can't get enough of her work. I decided to host the Daphne du Maurier Challenge. I really think this will be a fun one. If you've never read du Maurier, you're in for a treat. If you have, you probably want to read more of her! You can definitely overlap this challenge with others. In fact, she can fit into so many other challenges: Short Story, All About the Brontes (Rebecca, Jamaica Inn, The Infernal World of Branwell Bronte), Classic, Apocalyptic (The Birds), Non-Fiction, British, Mystery (My Cousin Rachel), Science Fiction (The House on the Strand), Carl's RIP Challenge. I can't think how many others. This challenge will run from May 13, 2010- April 19, 2011. Why those dates? 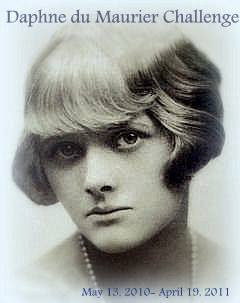 Daphne du Maurier was born May 13, 1907 and died April 19, 1989. You can of course post reviews before that date. Participants in this category will read 3 of Daphne du Maurier's larger works, her novels or non-fiction. You can also count a collection of her short stories as one book. Since this are smaller works, readers can choose 6 of her short stories to review. Although the most well known, Hitchcock was only one director to use du Maurier's work in film. Daphne's IMDb page is quite impressive. Besides The Birds and Rebecca, some of the books that made it to film include Frenchman's Creek and Don't Look Now. Participants in this category will watch 3 films based on du Maurier's work. Often you can rent these for free from your local library. If you happen to have cable or satellite, TCM sometimes plays these films. They post the monthly schedule online. This category includes works not written by du Maurier. She used books like Jane Eyre (Rebecca) and Wuthering Heights (Jamaica Inn) to inspire her own writing. These are just a few books. There are many others. Participants in this category will read 3 of these works. Maybe you can't decide what to read or want to read a bit of everything. Participants in this category will read or view 3 from the categories above (2 short stories count as 1 book). I know everyone needs another challenge like they need a hole in the head but I so admire Daphne du Maurier and want everyone to read her. You won't regret joining. I chose 3 as the number of books since I thought that was reasonable. Of course, I encourage you to read more and don't be afraid to change your reading list anytime. The time to complete this challenge is almost a year and you can join at anytime. I've created a blog for posting links for reviews: Daphne du Maurier Challenge blog. Once the challenge starts, you'll be able to post your links there. If you'd like to sign up,use the Linky Tool to link to your blog. You don't need a list. Hope you'll join in! I've joined up, apart from Rebecca I am very ignorant of this lady's works. I didnt even know she was english until today. What a lovely idea! Coming from Cornwall I started reading Daphne Du Maurier at a very young age, but I'm sure there are some more books out there. I have several of her books waiting to be read so I'll be joining in too, starting with a book of short stories The Breaking Point. Oh, Miss Lemon couldn't miss this! She is one of my favorites. I purchase her books whenever I find them and have a pretty good selection. So far I have not joined any challenges. I am not organized enough to keep track of them. I will be thinking of you all when I pull out one of her books to read. I'm tempted, very tempted. Will have to see what I have on my shelves and decide whether I am in for sure. Well, what's one more :P I'm bad at making up my mind, so I'm going for the Dame Daphne level. I'm dreaming of Manderley already! Great idea for a challenge! Du Maurier is one of my faves. I'm reading My Cousin Rachel for another group so I can overlap it easily. I haven't read The House on the Strand but I will write about this challenge on my blog when I have decided and link it back here. What a fantastic idea for a challenge! I have Rebecca on my tbr, I can always use a little motivation. Thanks for hosting. Oh! I'm excited about this challenge! As soon as I get my post up, I'll link in! Thanks for hosting! I didn't even try to resist! I love Daphne du Maurier ........any opportunity to return to Manderley I'll take and I'm sure there are a few I haven't read.......or read so long ago I've forgotten. Great challenge......thank you! I love this idea. I will see what's available to read and get a post up and linked when I'm feeling better. I've never read anything by Du Marier, but I'm tempted. I think I'll do the Dame Daphne category, since I'm never good at making up my mind ;). It's perfect timing for this challenge, so count me IN! I think I'll do the Dame Daphne level. Thanks for hosting! I really enjoyed Rebecca and am looking forward to reading some of her other works. Thanks for putting this together. Thanks for setting up this challenge! What a great excuse to read more books by the wonderful du Maurier! I am SO EXCITED!! I'm coming in a bit late for this challenge, but I haven't read a single thing by du Maurier and am ready to go! It seems like everyone knows all about and read Rebecca, but I think I might do that one first just to get my feet wet! I love Daphne du Maurier and would love to join the challenge. But as this is my first challenge, I'm a little confused as to when to join - after I've written a post or do I join before to tell what category I'm doing? Sarah- Either is fine. Thanks for joining!